Because I am still not able to get out and socialize, it is good to join up with other bloggers who have Wednesday Hodgepodge in common. Thank you Joyce @ From This Side of the Pond for bringing us together. My dad was a hunter but he mostly hunted for squirrel. And yes, we ate it. He also tried raising rabbits for food, but we had trouble chewing those sweet little bunnies. Hubby enjoyed going duck and pheasant hunting with friends a few years back. We enjoyed eating all that too. Son used to like deer hunting when he lived in the south and has the mounted deer head to prove it. Thanks to avid deer hunting friends, we have had tons of venison. I guess the only option mentioned that I haven't eaten is goose. 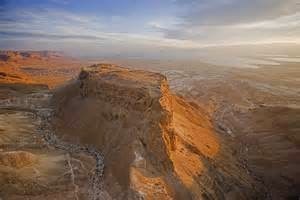 Masada south of Jerusalem, Israel is probably the most memorable high spot. Amazing! Yes, I have several Andrea birds that are beautiful decorative pieces and an Audubon plate. These are my favorite ones. A few minutes ago? I have to conserve trips so am learning to kill several birds with one trip using the walker. There were several good "Bird" songs from the 1950's - 70's, such as "Rock'n Robin," or "The Wings of a Snow White Dove." But, "Yellow Bird" by the Kingston Trio is probably the most memorable. Yesterday a friend shared with me how the Lord had recently revealed His will for her in a matter. No plans other than to have some candy at the door for little neighborhood kids. No costumes for this one! As a child growing up in rural south Louisiana in the 50's and 60's, we did not go house-to-house but celebrated times like this more as a community. I have not pulled out the canvas and paints since the end of July, but am ready to try my hand at painting again. Since I can sort of maneuver myself short distances without holding on the 4-legged walker, I think its about time. But, something has happened to my confidence. What is it about not doing something for a while that creates doubt about one's ability? I read an interesting article the other day that I could have written myself had I been so gifted. Anthony Doerr told a story about a Halloween costume experience as a child where he failed miserably to create the costume he envisioned. He went on to fast-forward that experience to adulthood and I could so relate. I see this beautiful sweep of paint on a blank canvas or a blog post that no one wants to stop reading - and in the end they are all mere shadows of what I had hoped them to be. I can't ever really create that masterpiece or articulate those initial thoughts in my head. "None of us can ever express the exact measure of his needs or his thoughts or his sorrow; and human speech is like a cracked kettle on which we tap crude rhythms for bears to dance to, while we long to make music that will melt the stars." There will probably always be a great chasm between what we want to make and what we are able to make. The important thing is that we try. "I have to remind myself that the beauty is not in the result, but in the attempt. To build our castles in the clouds - to sew a quilt, to start a painting, even to write a single satisfying paragraph - we need to live with the fear that we will stink, that no one will pay any attention, that we will fall like trees in an empty forest: the fear that we are going to take our glorious, flawless, nebulous ideas and butcher them on the altar of reality." Not only is it okay to try and fail, risk being made fun of by stepping out to do something different, or whatever is challenging; it is necessary. So, I am going to pull out that blank canvas and the paints that speak to me and risk making a huge mess because it is important that I try. How is it that only a Sister can hurt your feelings without hurting your feelings? Saturday, I shared with my sisters that I wasn't feeling too good and was just having an emotional pity party. The foot was really acting up and I was having to watch Hubby vacuum, dust and wet mop the floors and even pass a swifter over the most dusty surfaces. He then did some work outside and even a small re-org of the garage. And all I did was watch! On Sunday Sister2 called to check on me. I told her I was doing much better, but that Saturday had just been a difficult day for me. She very gently said, "Lib, you know you are a control freak, and you aren't in control of anything right now. This is new territory for you." All I could do was smile and say, "Sis, you know I think you hit the nail on the head!" Just when I think I've given the control over to the One in Control Of All Things, I realize that isn't the way it is at all. Oh yes, perhaps the biggies like the rising and setting of the sun and changing of seasons and even some relationships, but my day-to-day relinquishment, not so much so. So, thanks Sis for putting things back into perspective for me. How do you handle not being in control? These precious neighbors all decked out for a "Trunk or Treat" event at their church brought me a beautiful floral bouquet this afternoon. Is this not the sweetest face? I received a blessing from Just Following Jesus today. Yes, I am aware it is after noon on a Friday. I am also aware that it is not imperative to post a blog entry every Friday or have it post by 2AM for that matter. since that seems so applicable to my life right now. 1. Week 3 plus 2 days after foot surgery puts me one day closer to having the eyeball pin removed from second toe on right foot and hopefully not having to use the walker. I'm still having some discomfort from the other incisions and bones healing, but mostly late evening and night. What is it about night time and pain. Crazy! 2. For the 4th day in a row, I have actually put on clothes clothes. Since I had been moving from bed to walking around a bit, to the recliner, to walking around a bit, to the bed and repeating this over and over all day long, I have found loose fitting and comfy warm casual wear to be the order of the day. Plus, I have not seen any reason to apply makeup. Hubby hasn't minded. Or so he says. However, a friend called to say she was coming over on Tuesday, so I felt compelled to at least put on something that didn't resemble pj's and actually put on a little makeup. She called that afternoon to say she wasn't able to make it but would come the next morning. In the meantime, another friend text'd to say she was coming over the next afternoon. So, I was up and at it early to be ready and yes to go through the time consuming process of getting ready. Sure enough she showed up and we had a great visit. Incidentally, she did not seem to notice the makeup or my clothes clothes. The second visit of the day didn't happen so we rescheduled for today. Again, I'm up early awaiting Hubby's return from the gym so I can get showered and dressed to be presentable for the day. Let me just say here that Hubby has been such a trooper during this whole ordeal. Don't know what I'd do without him and don't want to find out. Now, back to story. I'm dressed again with a very minimum of makeup but red lipstick to match my bright red top and ready for the visit. A few minutes ago she text'd to say she can't make it, but how about Monday. Do you know what that means? Of course you do. Dressed in clothes clothes and makeup another day and here all by myself. Seriously, I'm grateful for special friends who want to come over and spend time with me regardless of what I have on or what I look like. They are a blessing and I really won't mind making myself presentable again on Monday. 3. I am also grateful for a pair of the most comfortable, soft, wide legged pants I have ever worn. They are from Soft Surroundings and I only wish I had ordered 15 pairs. They are my uniform these days. 4. I am loving these early days of Fall and have the sunroom windows open to prove it. So what if more dust filters thru the screens to add to the existing layers. It will all be there when I can safely pass a swifter or dust cloth over the surfaces. In the meantime, I will enjoy time spent enjoying the refreshing fall cool temps. That's enough of my Friday Fragments so when you have time hop over there and see what other bloggers are fragmenting about. "From This Side of the Pond"
We just aren't at that seasonal stage yet here in the Arklatex (Northwest Louisiana). We have a huge pecan tree behind our house and although it is full of pecans, the leaves haven't started turning yet. The oak tree in our front yard is also hanging on dearly to its green leaves. But, when that time comes, I will not hesitate to leave whatever undone in order to enjoy the color. Trying to keep my balance. As I am still using a walker to get around due to foot surgery three weeks ago today, maneuvering the "turns" has been a challenge. Now, to answer the true nature of your question, sometimes as a blogger I feel 'every time [I] turn around' it is time for another post. Am I the only one who feels this way? If left to my own "common man" nature, it would be impossible. My personality wants to retaliate and/or make a verbal response. This is a struggle for me even now, but with the Holy Spirit reminding me its not my fight to fight I am better able to 'turn the other cheek' and move on. I don't mean to simplify this, but without the Lord in my life bringing me moment by moment closer to His plan for my life, I would be a mess for sure. I cannot tell you the exact last time, but it is inevitable that when I lose something, I can remember putting it exactly where I thought I would look for it later. I will tell you this funny. Right after my surgery while my sis was here helping out, I put the house phone into my bosom to carry into another room because I was using a walker. Later, we searched all over for that phone until I realized I was wearing it. A bigger bosom might have helped. Not sure. I have definitely been on the receiving end these past three weeks. Friends have brought food and sent cards which has meant so much. I must remember to pay forward when I am able. Or for me, Joyce. I love sweet red apples, red grapes, green kiwi, yellow bananas, and a peach peach. Not to mention a green/red combination watermelon. But to keep it seasonal, I will have to go with apples and peanut butter. The Hunt for Red October has always been a favorite of ours. But I loved October Baby and thought the subject of abortion was handled beautifully in this film. Lately, I have been made aware of so many hurting and struggling people around us. These are fine, Christian families who are going through some really difficult times whether it be with health problems, or issues with children. I've wondered how to encourage them other than to just let me know I am praying for them. Is this enough or does God require more of us? I think this is something we as Christians deal with. How can we minister to someone from a distance who is hurting? In thinking about this this week, I remembered an old song sung by Babbi Mason entitled, "Standing in the Gap." Please visit other Fall Show Houses who have linked to this blog. Because I knew I would be somewhat incapacitated for an undetermined length of time, I climbed into the attic and with Hubby's help retrieved all the Fall decorations. A week prior to my surgery, I had it all done and ready for us to enjoy. 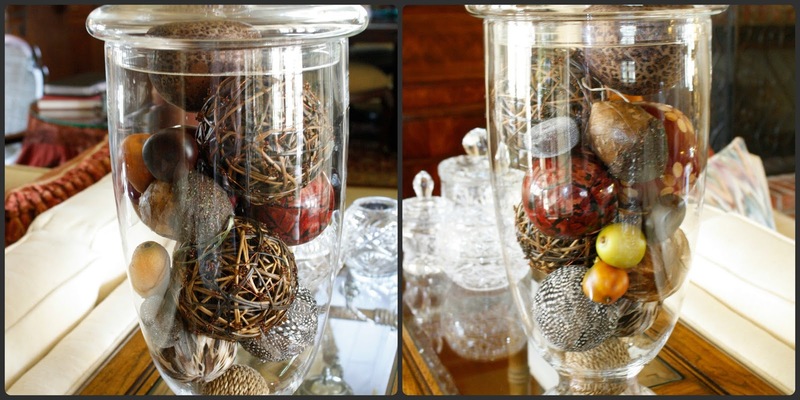 Regardless of the season, I always keep a very simple arrangement on my mantel because of the over-sized picture. Balance of materials and objects is very important. I am using a small arrangement on the breakfast table. The neutral sofa allows me to use seasonal pillows and decorative items on the sofa table. These fresh flowers balance all the faux items I am using and bring in a brightness that Hubby and I both enjoy. 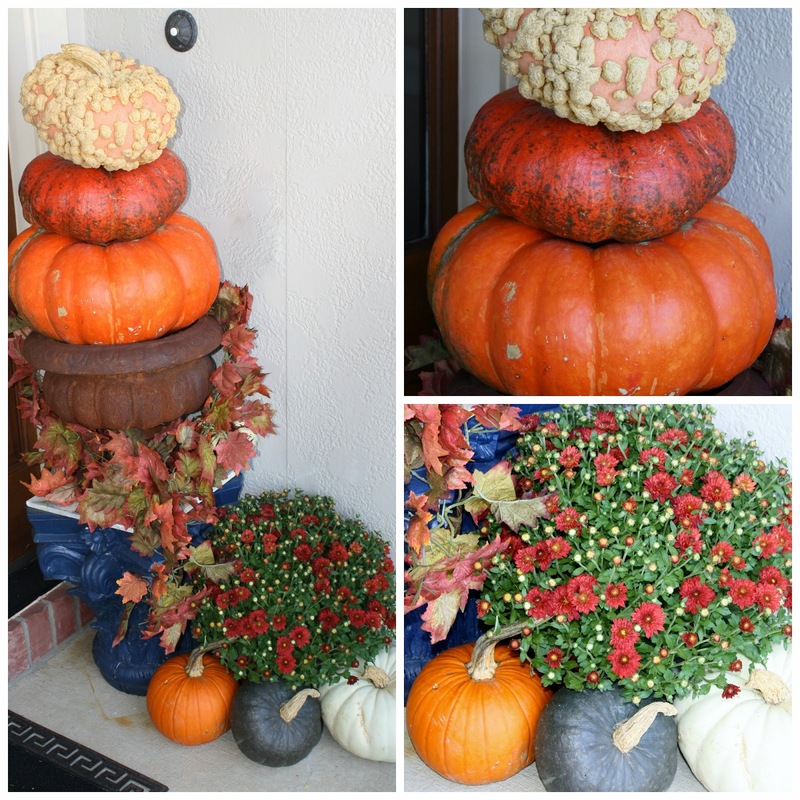 This little fall arrangement finds itself in a different location every year. This year I am enjoying it on top of my lingerie chest in the master bedroom. I knew it would be nice to see while recuperating in the bed. The front of the house was not left out. Thank you for visiting my home this Fall. Now, see what others have done. it is good to be back hodgepodging with my fellow bloggers. Yes, we have a financial planner which relieves much of the stress of trying to do it ourselves. But, on the other hand, I do not understand much of what is going on and feel stressed to think there may not anything there when I need it. Hubby and Chase (our young, handsome adviser) assure me I will be taken care of and that is comforting. Besides, my future is not in the hands of the adviser or the stock market. Thank you Jesus!. Car handlers who occupy space on the roadway who are oblivious and void of any driving skill; people in positions of customer service who have no idea what customer service is. How to be a really good painter. Both of these concern me greatly, not to the point of fear, but because I see the lack of concern and prior planning on the part of our government. The incident in Dallas is a prime example that we are not prepared and are not in a strong position to fight it. To send 3,000 warriors to another country to try to accomplish what thousands of others who have been on site for years have not been able to do, and at the same time leaving our borders open and in-coming immigrants untested just makes no sense to me and reassures me that the powers-that-be have no clue. This causes my greatest concern. I love the sarcasm and aloofness of Garfield and the sweetness of Tigger. That may tell you something about me too, huh. My sisters and I share many interesting stories about each other. Being the oldest and not being against taking advantage of my younger, easy-going sister, I did some not so kind things to her. But, she especially loves to tell the story of the night she found me completely relaxed in our new 50's round framed chair. It was just like this one except it had a solid red stretched canvas. Well, this sneaky little sister of mine crawled under the furniture to reach me and stuck a pin into my bottom. I liked to have never figured out what happened, but later learned that the whole family was in on her revenge. We still get quite a laugh out of that. 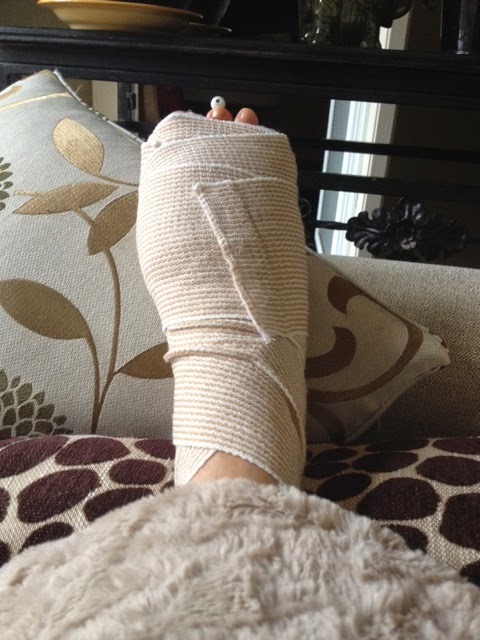 A week ago today I had right foot surgery involving the removal of a neuroma between toes two and three, tendon stretched and hammer-toe corrected of 2nd toe (notice cute little eyeball pin), big toe broken and straightened and bunion shaved off. Yes, it was a bit painful the first few days and pain meds helped greatly. I don't like those things so got off them as soon as I could. My sis was here to keep me company and I can't tell you how much we enjoyed being together. We three sisters always try to be there for each other and that is comforting. That being said, Hubby has been great and most helpful. I have insisted he go to the office every morning which gives me an opportunity to do some things for myself (yes, you could call that independence if you want to), but it also keeps him from getting tired of me before I'm back on two feet. 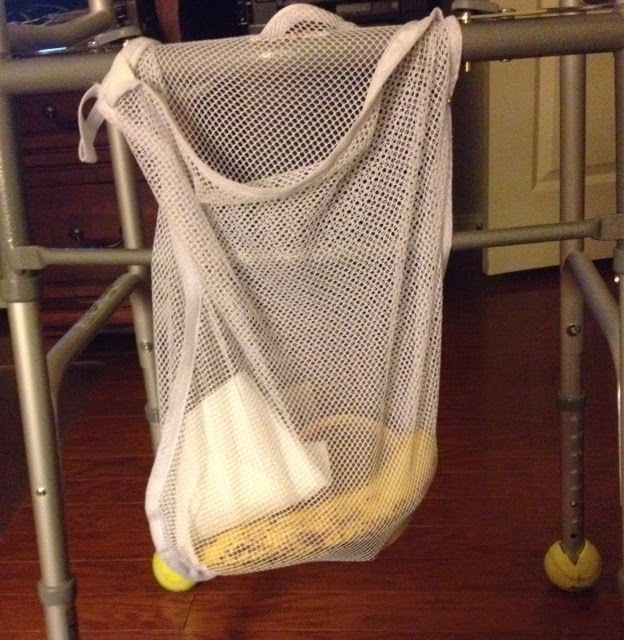 He put this little laundry pouch on my walker so I can carry things around as needed. I haven't figured out how to get a bowl of soup to my chair yet, though. LOL! This little four-legged walker has made it possible for me to move around on one leg for which I am most grateful. But, ladies, this has reinforced to me the importance of maintaining a strong upper body and core. If I had not been doing this for several years, I know that I would not have the endurance and strength to hold my weight on my arms. So please, if you aren't currently doing upper body and core exercises, start NOW! I heard a song this morning after watching an old 1983 Billy Graham Crusade message on the Holy Spirit. I am praising God for His convicting Holy Spirit who called me to Himself many years ago and baptized me into His family and with the Holy Spirit. 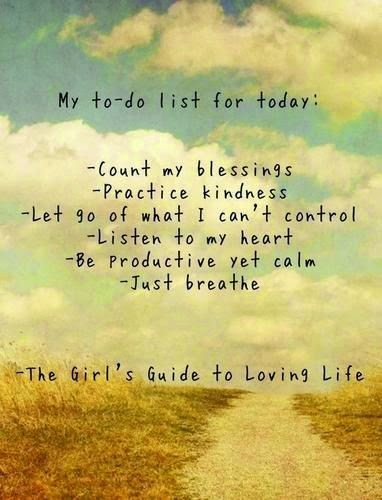 May this beautiful message sung by Carrie Underwood bless your heart today as well.